OK, it’s been nearly two months now that I’ve been like a coiled spring ready to unleash massive de-cluttering energy on a storage cupboard and the dastardly drawers of papers. I am so ready. Primed, even. Excited. For even more emotional support there has been the turn of the year – a seemingly made-to-measure time for this kind of purging. I’ve occasionally become a tsunami tidal wave of pent-up decluttering energy by re-reading motivational decluttering hand-holding posts from wonderful Miss Minimalist and Mnmlist (Leo Babauta). And yet my tidal wave is stuck at its peak, not washing all over the cupboard and papers drawers. I realize now that as I’ve stripped away a lot of things over the past couple of years, I’ve found myself more susceptible to natural forces. In the sweet vulnerability of less, I am more in tune with natural daily and seasonal rhythms. And more affected by them. My trapped tidal wave of tension comes, I think, from two opposing forces: 1) an intellectual and emotional desire and need to purge, de-clutter, create new spaces and 2) a forceful, primal urge that I think we all have towards storing supplies, bundling up and feathering our nests during winter. You don’t need to read Children of the Forest to know this is a powerful force. The urge to feather our nests for winter. We bundle our bodies up with layers and layers of clothing, scarves, thermal socks, wooly hats, sheepskin coats to protect from the cold and meanwhile we also surround ourselves with all kinds of clutter in a primordial need to cosset ourselves and cozy our home. If you were an Inuit (perhaps you are – hello!) you’d be wanting to fill that igloo up with warm materials as much as possible. And so in wintertime there’s a natural inclination towards bundling up which opposes an intellectual and emotional need to declutter for the (humankind created) calender new year. Some of us, well me anyway, have strong bear and/or hedgehog hibernation inclinations and oh gosh, this is challenging to work against no matter how psyched we are to CLEAR EVERYTHING OUT for the New Year, take advantage of the timing to STRIP AWAY UNNECESSARY and OUTMODED people, possessions and passing whims, CLEAR THE DECKS for the arrival of new, unlimited opportunities and ways of being in the new year. Perhaps the solution is to put yet another sweater on and work fast, like squirrels do between snowstorms. And be pleased that we have so many feathers in our nests – so many, in fact, we don’t need as much. Let’s remember there are many others with tattered nests who could use some of our nesting materials. That helps me to share my store of winter supplies, maybe it helps you too. 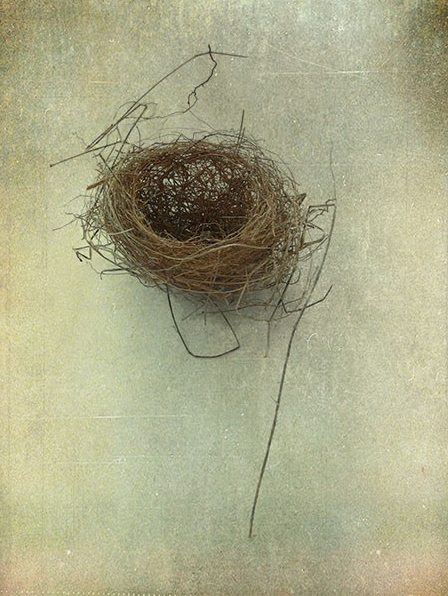 Image Birds Nest, Fine Art Photograph borrowed from Judy Stalus. Visit her Etsy shop to buy Judy’s stunning fine art prints. I love the image of the squirrel working fast, I’ve been doing squirrel bursts as I’ve felt guided! I think the wave breaks when it’s ready and the secret is in being open to its call, not pushing or trying, just allowing ourselves to hear its call.